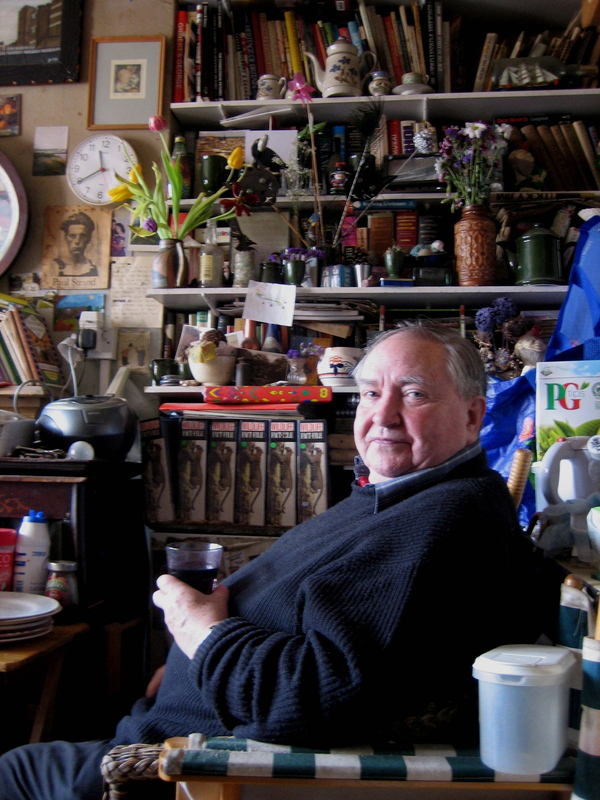 Above a curry house in Brick Lane lives Clive Murphy, like a wise owl snug in the nest he has constructed of books and lined with pictures, photographs, postcards and cuttings, over the thirty six years that he has occupied his tiny flat. Originally from Dublin, Clive has not a shred of an Irish accent. Instead he revels in a well-educated vocabulary, a spectacular gift for rhetoric and a dry taste for savouring life’s ironies. He possesses a certain delicious arcane tone that you would recognise if you have heard his fellow-countryman Francis Bacon talking. In fact, Clive is a raconteur of the highest order and I was a willing audience, happy merely to sit at his feet and chuckle appreciatively at his colourful and sometimes raucous observations. I was especially thrilled to meet Clive because he is a writer after my own heart who has made it his business to seek out people and record their stories. At first in Pimlico and then here in Spitalfields through the sixties and seventies, Clive worked as a “modern Mayhew, publishing the lives of ordinary people who had lived through the extraordinary upheavals and social changes of the first three-quarters of the century before they left the stage.” He led me to a bookshelf in his front room and showed me a line of nine books of oral history that he edited, entitled Ordinary Lives, as well as his three novels and six volumes of ribald verse, all of which are available through his own publishing company Brick Lane Books. 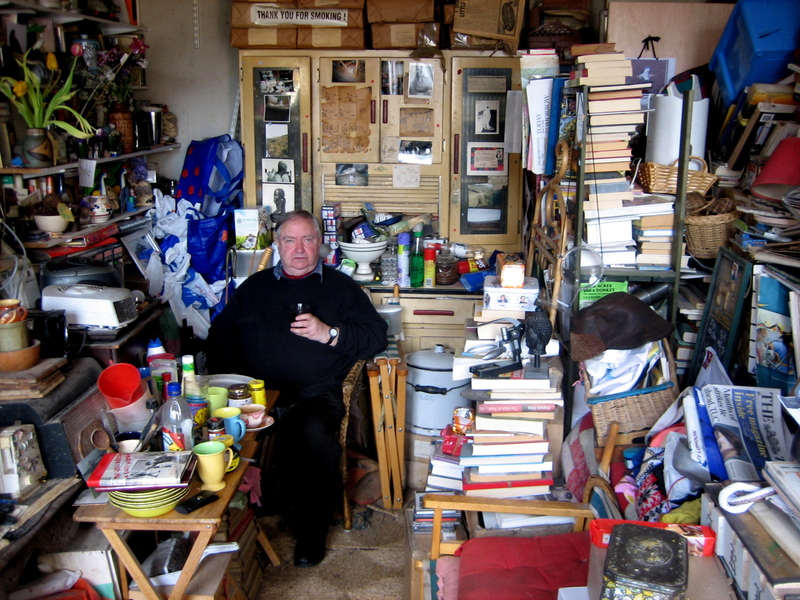 I was astonished to be confronted with the achievements of this self-effacing man living here in two rooms in such beautiful extravagant chaos. Much to Clive’s frustration, the project foundered when he got to the middle classes, and he coloured visibly as he explained, “I found the middle classes had an image of themselves they wanted to project and they asked to correct what they had said, afterwards, or they told downright lies, whereas the common people didn’t have an image of themselves and they had a natural gift of language.” I was curious to understand the origin of Clive’s curiousity, and learn how and why he came to edit all these books. And when he told me the story, I discovered the reasons were part of what brought Clive to England in the first place. “I lived a sheltered life in Dublin in a suburb and qualified as a solicitor before I came to England in 1958. My mother wanted me to be solicitor to Trinity College where her father was Vice-Provost but I had been on two holidays to London and I’d fallen in love with the bright lights. I wanted to see a wider variety of people. So as soon as I qualified I left Dublin, where I had been offered a job as a solicitor at £4 and ten shillings a week, and came to London, where I got a job at once as a liftman at a Lyons Corner House for £8 a week and I have lived here ever since. At that time there was an organisation called Space which let out abandoned schools and warehouses to artists. In 1973 I answered their letter in The Times and they found me this empty building, it was the Old St Patrick’s School in Buxton St. I lived in the former headmaster’s study and that’s where I recorded my first East End book. I had nothing but a tea chest, a camp bed and a hurricane lamp. There was no electricity but there was running cold water. Meths drinkers used to sit on the doorstep night and day, and at night they would hammer on the door trying to get in. I was a bit frightened because I had never met meths drinkers before and I was all alone but gradually three artists came to live in the school with me. Then I had to leave the school house because I was flooded out and, after a stint on Quaker St, I saw an ad in Harry’s Confectioners and moved here to Brick Lane in 1974. The building was owned by a Jewish lady who let the rooms to me and a professor from Rochester University who only came to use his place in vacations, so it was wonderfully quiet. There was a cloth warehouse on the ground floor then which is now the Aladin Restaurant. Every shopfront was a different trade, we had an ironmonger, an electrician and a wine merchant with a sign that said ‘purveyors to the diplomatic service.’ The wine merchant also had a concoction she sold exclusively to the meths drinkers but that wasn’t advertised. It interested me that Clive now writes poetry because I think he is a poet at heart and there is an unsentimental appreciation of the poetry of the human condition that runs through all his work. He chose his subjects because he saw the poetry in them when no-one else did and the books, recording the unexpected eloquence of these “ordinary” people telling their stories, bear witness to his compassionate insight. Clive gave me copies of his two East End books and, as we sliced open a box I was delighted to discover “new” copies of books from 1975, beautifully printed in letterpress with fresh unfaded covers and some with a vinyl record inside to allow the reader to hear the voice of the protagonist. I could not wait to go home and read them, and listen. Now I will never be able to walk down Brick Lane again without thinking of Clive Murphy, living there above the Aladin Restaurant, as a beacon of inspiration to me while I am running around Spitalfields pursuing my interviews. With Clive’s kind permission, I shall be publishing an extract from each of his two East End books, The Good Deeds of a Good Woman by Beatrice Ali (An account of a mixed-race marriage) and Born to Sing by Alexander Hartog (A picture of Jewish life by a failed tenor who believes in re-incarnation), over the next fortnight to give you a flavour of his remarkable work. Clive Murphy’s oral histories are now available at Labour and Wait and his ribald rhymes can be purchased from Rough Trade East. I feel privalidged to be the next person Clive is to write about. Ordinary lives? I am ordinary? how did i miss this one? wondeful!!! “Four Acres & a Donkey” is one of my all time favourite books! To think I was so close to Clive Murphy while doing my degree at UEA London!